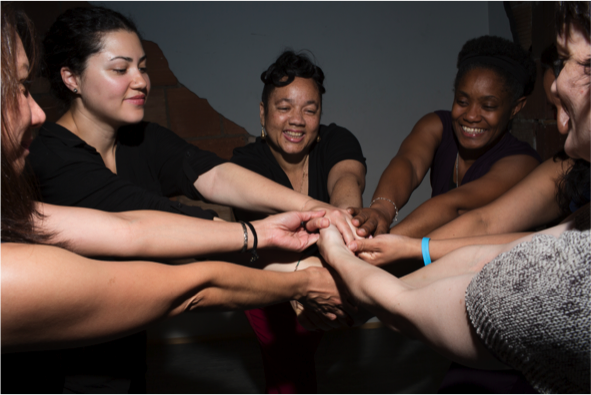 Dance performance and social justice powerhouse Gibney has developed an innovative and effective program, Move to Move Beyond, that uses the transformative power of movement to make a difference in the lives of intimate partner and gender-based violence survivors. Launched in 2000 in partnership with Sanctuary for Families, Move to Move Beyond provides a safe environment for building self-esteem through positive physical expression and has vividly demonstrated that movement, physical awareness and creativity can play a remarkable role in healing trauma. The program has since expanded to include Safe Horizon, Barrier Free Living, Sakhi, Community Health Action of Staten Island among many other New York City organizations. Over 365 Move to Move Beyond workshops are offered annually to individuals and families who are on journeys to healthier futures. Open to anyone. No dance background necessary. Gibney Dance’s Amy Miller, Senior Company Director, and and Devin Oshiro, Community Action Artistic Manager, will be facilitating.